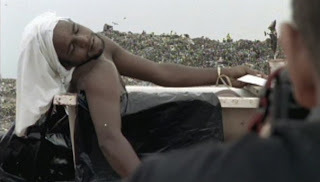 The title of this film refers to the hopeless environment in which its subjects ply their trade as ‘garbage’ pickers in the world’s largest landfill in Rio de Janeiro. For avant garde artist/photographer Vik Muniz, this serves as the source for his next international artistic creation. Best known for his ‘Pictures of Chocolate’ series from the late 90s, the Brazilian native drew pop art style portraits out of chocolate syrup while working in New York. Now in 2006, Muniz, along with his documentary crew helmed by Lucy Walker, attempts to create great art from the most useless of substances – garbage. This goal comes after declaring to the camera that after achieving his wealth and success, he had become dissatisfied with fine arts. And this latest project serves as a homecoming for Muniz, an effort to give back to his homeland where he grew up with little opportunity to succeed other than his own talent and desire for success. Muniz is clear with his plan and enters the landfill with his still camera and his assistant looking for subjects that will serve as the chief artistic associates for his venture. With Walker’s camera behind Muniz we get to meet a unique subculture of labour, colloquially called ‘garbage pickers’, but more appropriately ‘pickers of recyclable materials’ or catadores in Portuguese. These individuals have one of the most unenviable jobs in modern society – sifting through waste to pick out plastic bottles, cans and other materials to sell to recycling companies for very little money. Like vultures, we watch in astonishment at the kind of muck and filth these people will search through in order to find their objects of value. But within this despair, Walker and Muniz find an insatiable verve for life. All the catadores get paid and make a living, and they all have an interesting story about how they ended up in such squalor. The most emotional story is from Isis, a beautiful young girl whose life spiralled downward when her three-year-old son died of pneumonia – a story recounted by Isis in a devastatingly emotional confession. Tiao’s story is the most inspiring, as he has been a catadore since age 7, but his perseverance and pride in his job helped him develop a union for the pickers, protecting them from being exploited for their labour. Muniz doesn’t so much give his subjects a free helping hand as encourage them to express their own latent artist talents and transform the ugliness of their world into something profoundly beautiful. The works of art that result are astonishing. They include large-scale reproductions of other famous works, such as the Death of Marat, made entirely out of garbage and photographed into entirely new works of art. By the end we come to love Muniz’s subjects like members of our own family, completely invested in their journey. And with the proceeds fully split among the catadores, when we watch the auction price of Tiao’s Marat piece go up and up and up, it’s a wholly satisfying realization of their collective dream. Waste Land is available on DVD from EOne Home Entertainment in Canada.